One baby quilt down, 5 to go. I am determined to keep these baby quilts simple since I'm already behind on them (the babies have been born). I did simple stripes with blues and pinks--not one of my normal color combinations, but I think I like it. I didn't really like this quilt while I was working on it, not sure why--maybe because I did some loopy quilting, but now that it's finished and washed, I like it. The back is my favorite part! The quilting is really sloppy--if I was a redo-er, I'd have picked it out and started over, but I'm not, so sloppy it will be. Absolutely beautiful!!! I love the Brooke Owls for the backing!! Where is the daisy fabric from? I have an obsession with all things 'daisy'! I believe the daisy fabric is by valori wells, it's one of those I've had for quite a while. It's really pretty. Very, very cute! I need to try quilting like that. . . stippling just takes too long sometimes! The fabric on the back is sooo cute! And I love the blue with the pink. oooh, owls and mermaids!!! can you hear my whoops of delight? It looks awesome!! I love the loops! great job. Absolutely adorable quilts. What creativity ... you are very talented. Oh lovely, I love that fabric on the back! I LOVE it!!! I'm not a re-doer either!! :) Looks great and whoever gets it will be THRILLED!!! hooray for sloppy! the baby won't care! I love the different prints in this quilt, it is a great conversational piece for a little one learning to talk! It's very cute! And let's hear it for the non-re-doers who can accept less than perfect work! Who wants to spend time picking out all that stitching? LOL. I actually think it kind of adds an oddball charm to these quilts that will get used and washed a thousand times before it completely disintegrates (hopefully). And I think it helps the recipients actually use it seeing that it's not supposed to be ironed, starched and displayed somewhere. Love it. Ehat a gorgeous quilt! I'm with you....the back is fantastic! whats not to love!!! 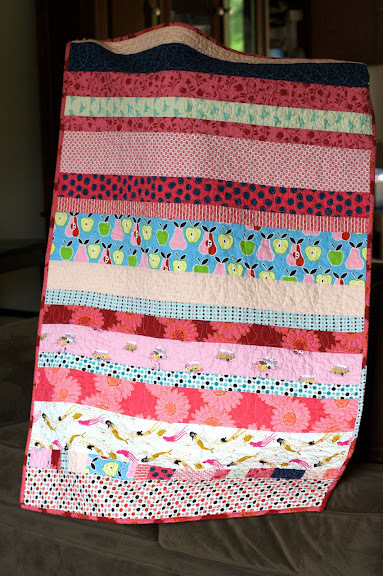 this is beautiful...and it looks so snuggly with the loopy quilting! OOOOOO, what a wonderful quilt. It's absolutely perfect for a child. I think your loops are great. 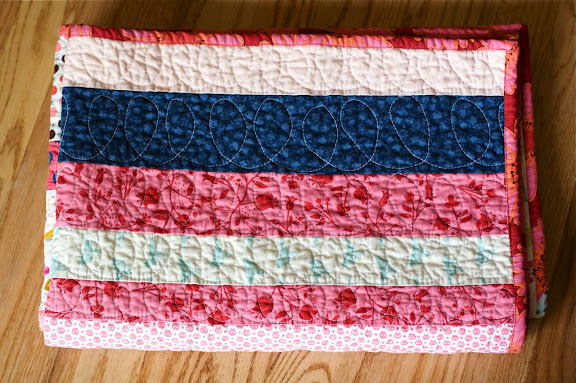 As a matter of fact while I was scrutinizing this quilt I thought, "darn, I wish I could make loops like that". i think it looks great. Love those pink daisies. I love this quilt! especially the back. I have wanted to try the loopy quilting method but i am afraid. I'm all about finishing vs. redoing! Great quilt! it's so great! i think loopy quilting is perfect in a stripe quilt like that. :) and it's a fun color combo. Fantastic - I love that back fabric as well and especially love the loopy quilting. I love the quilt and your machine quilting was so nice. I think it is terrific and the babies will love them! Huh! I wouldn't think I'd particularly like that color combo either, but it really works! Adorable! I think the back is really cute too! Good for you! I love those owls on the back! Any clues as to where I might buy some?! Thanks...love all your work and congratulations on baby #3 - you'll have your hands full for sure! scrapworking, the owl/tree print is a sheet that i purchased from pottery barn. good luck. Beautiful. 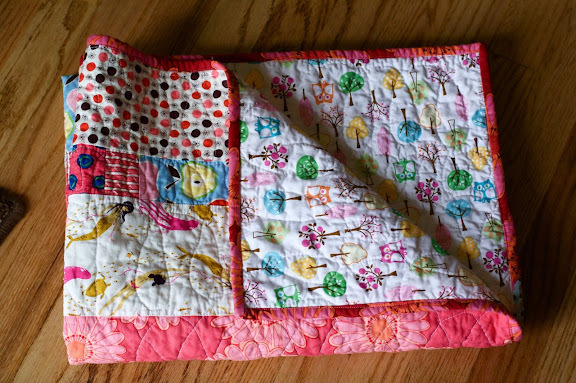 The simplicity of this quilt is wonderful and I love the quilting and how it's all crinkled after washing. 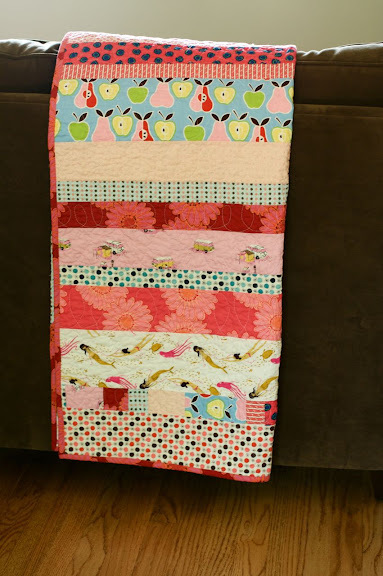 This is a really cute quilt, nice color selection! Nettie...wanted you to know...I am still loving every single quilt you create. You are one talented lady. Your random choices of fabrics really go perfectly together, as well as the patterns you put together. And then there is always the beauty of your backings! Quite spectacular, really! Hi, Thank you for your wonderful blog site. Your quilts are so beautiful, I love your quilting technique, I just have to dive in and do it. My first big step into free motion quilting hopefully this weekend. camp follower bags (creation) I am participating in a blog hop through Trends and Tradition w/Heather Mulder and I am hooked on quilts. I enjoy viewing other quilters in the use of color and techniques. Keep up the great quilting.